A great deal of very important information dealing with the basics of Indian music was discussed here. Let’s take the opportunity to review them. 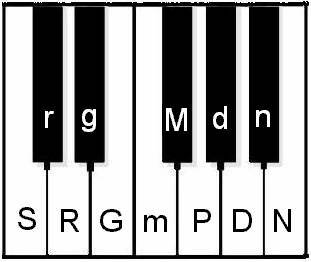 The keyboard of the harmonium has a set of three fundamental units of keys. The fundamental unit is shown in Figure 8.1. 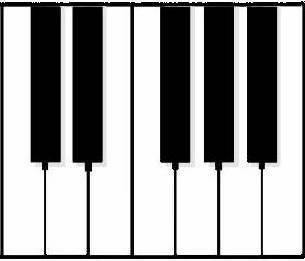 This structure of any keyboarded instrument has this fundamental unit repeating over and over again. In harmonium, it usually has three repeating patterns. We discussed a little later that a fundamental unit is a scale, which consists of seven notes. 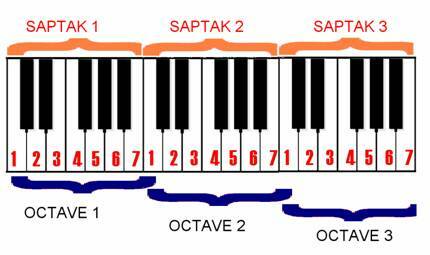 Once eight notes (7 notes + starting note of the next fundamental unit) are completed, it is known to have completed one octave in Western music, or a saptak (seven notes) in Indian music. Figure 8.2 shows the scales and octave vs. saptak comparison. In understanding the relationships between any two notes, we talk about half steps and whole steps. 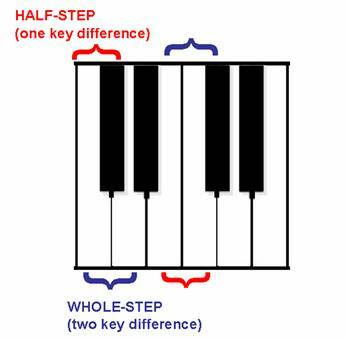 The half step is one-key difference from the first note. A whole step is a two key difference. The half-step is the smallest unit of measure in describing distance between two notes. Look at this diagram and recall from Chapter 5 that half-step does not always mean from a white to black (or vice versa). Likewise, whole-step does not imply a white-to-white (or vice-versa) relationship. The red bracket is the half-step, while the blue is the whole-step. The three saptaks in a typical harmonium is shown in Figure 8.4. Figure 8.6 shows these notes in the eyes of the entire harmonium bearing the madra, madhya, and tar saptaks. Lastly, here are the ten thats Visnu Narayana Bhatkhande developed. Unless you have developed full knowledge of the material, do not move onto the next unit. The next unit will develop on more theoretical applications which cannot be understood easily without understanding this material first.